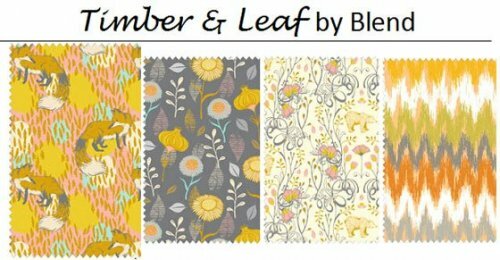 We've received batiks from Robert Kaufman, more Australian fabrics, some solid flannels from Marcus Brothers, and the four groups pictured below: an adorable flannel line from Marcus, gorgeous stripes from Alexander Henry, a contemporary print from Blend fabrics (with foxes & bears! 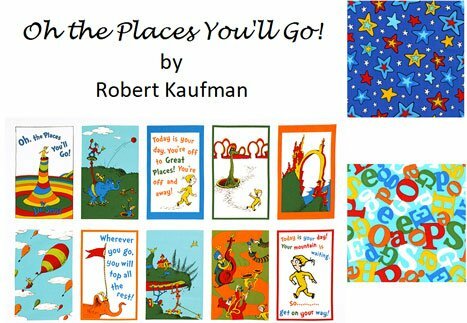 ), and another Dr. Seuss print from Robert Kaufman--"Oh, the Places You'll Go! A note to those of you participating in the Imperial Blooms class: If you signed up for this class, you need place your order and pay for your background (felted wool) fabric by Sunday, Jan 31. 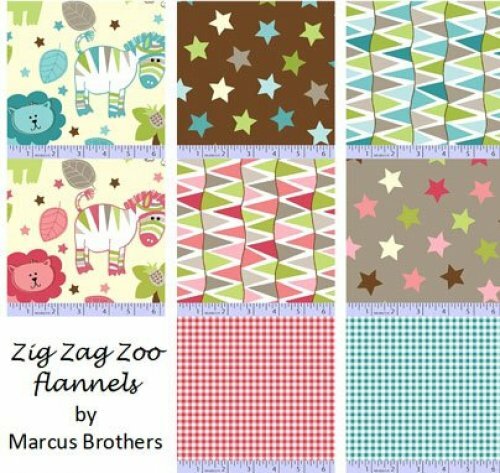 You need slightly more than 1 yd for the quilt, but you can order 1/2 yd to start off with, if you want. We have samples of available colors in the shop. Also, please note that the 1st meeting of the Saturday class for Imperial Blooms will be on Feb 23, 1:00 - 4:00 p.m., not Mar 9, 10 a.m. - 1:00 p.m. Beginning in April, Saturday classes will meet the 2nd Saturday from 10:00 a.m. - 1:00 p.m.
Hand Piecing Group, Tue, Jan 22, 9:00 - 11:00 a.m.
American Girl Doll Sit & Sew, Wed, Jan 23, 1:00 - 4:00 p.m. 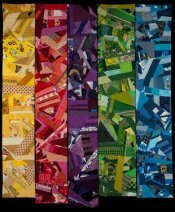 Fabric Weaving in Three Directions, Rami Kim, Thu, Jan 24, 10:00 a.m. - 4:00 p.m., $55, supply list. Learn how to create an intricate cubic pattern with an optical-illusion affect by weaving folded fabric strips in three different directions. (Shown here in the center of the purse.) 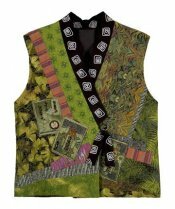 You'll also learn how to add 3-dimensional blossoms from lined prairie points You can use these techniques to take your quilts and wearable-art projects to another level. Pixeladies Piece Party Workshop, Pixeladies Piece Party Workshop, Pixeladies--Deb & Kris, Sat, Jan 26, 10:00 a.m. - 4:00 p.m., $40, supply list. In this day-long homage to 1968, Deb & Kris will encourage you to "break free" from the "establishment" and create blocks without patterns. Using scraps from your scrap bag (not to worry, they'll bring their scrap box, too), you'll make a placemat sample. You can choose instead to start working on a quilt. 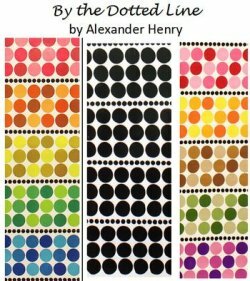 Since you won't be encumbered by using a pattern, you'll be able to concentrate on color and value. To finish off your sample, Deb & Kris will show you the quilt-as-you-go technique and bias binding. And no Pixeladies Piece Party is complete without their genuine Sock-it-to-Me cake for you to eat! They'll pass on their melt-in-your-mouth recipe on workshop day. 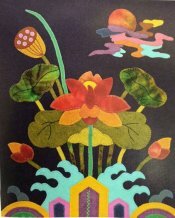 ‘Doo-Roo-Mah-Gey’ Wall Hanging, Rami Kim, Fri, Feb 1, 10:00 a.m. – 3:00 p.m., $48, supply list. Doo-Roo-Mah-Gey is the name for a coat that is part of traditional Korean costumes called Hanbok. 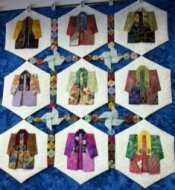 This quilt wall hanging is fat-quarter friendly, and you can expand or reduce it to any quilt size you want by changing the number of hexagon blocks. The blocks are connected using 3-D pinwheels and yo-yo’s, so you could even change the size a year from now! 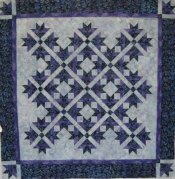 This quilt looks wonderful in seasonal colors, too! Think Spring! 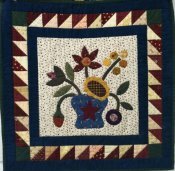 Needle-turn Applique, Judy Cummings, Sat, Feb 2 & Feb 23, 9:00 a.m. - noon, $30 (includes pattern), supply list. Make a charming wall hanging and learn the basics of needle-turn applique, including curves and points. 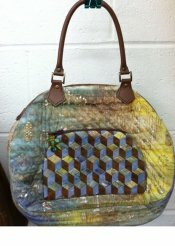 My Favorite Bag, Martha Kunkel, Sat, Mar 2, 10:00 a.m. - 4:00 p.m., $40, supply list. Make a large or small version using the Katie Cupcake pattern. This very stylish and practical bag features grommets, a contrasting tie, and many, many pockets. One can never have too many pockets! Please see our website for descriptions/pictures of the above classes and all of our other classes and groups: http://www.thistledewfabricshoppe.com/classes.htm We have scheuled another Beading class on Sunday, April 14, and we're working on scheduling another Beginning Machine Quilting Class and 2-Fabric Applique class.